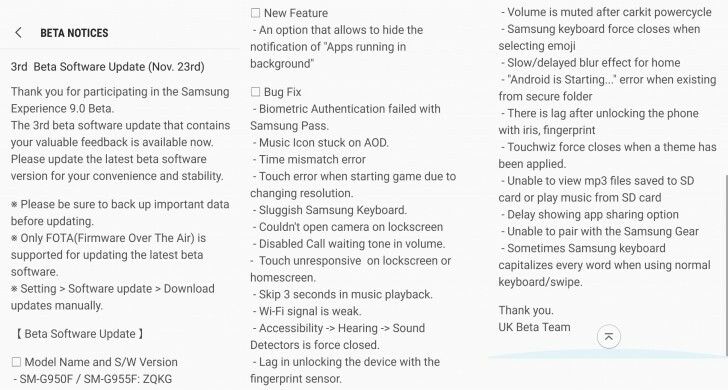 Update: The Android 8.0 Oreo update is now rolling out to Galaxy S8 and Galaxy S8+ units across the UK. It's a 600MB update, which includes the November security patch and major improvements to Bluetooth stability. Looks like Samsung Galaxy S8/S8+ users who are part of the Oreo beta group may soon get to test the third beta build of the Android 8.0 firmware. The information comes courtesy of a Samsung representative who is part of the company's UK Beta Team. In the rep's own words, the update will be released "very very soon." To quickly refresh, the Oreo beta program for the Galaxy S8/S8+ - officially called Samsung Experience 9.0 Beta - kicked off earlier this month. The second beta build arrived just a week later, bringing some minor improvements as well as stability and bug fixes. The beta program is currently limited to the UK, US and South Korea. The second wave of countries that'll get access to it include Germany, Spain, France, Poland, India and China - no info on exactly when will that happen though. Final version of Oreo for S8 not gonna release prior to the release of S9 ! !